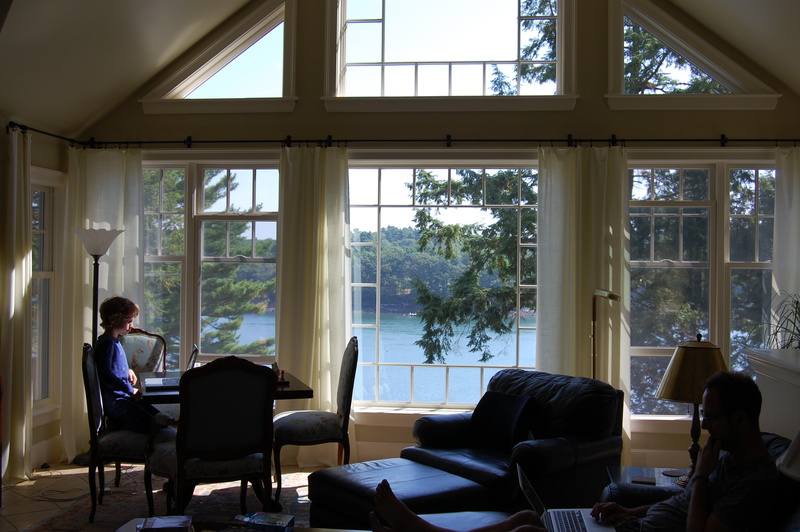 We have a new project that is located in Edgecomb, Maine on the Damariscotta River. The Damariscotta is a 19.0-mile-long tidal river, which empties into the Atlantic Ocean. This river known for its Oyster beds, Mussel Farming, clamming, fishing, and in recent years it has become a huge tourist destination. This is the first job I have had in this area, and it is truly amazing. 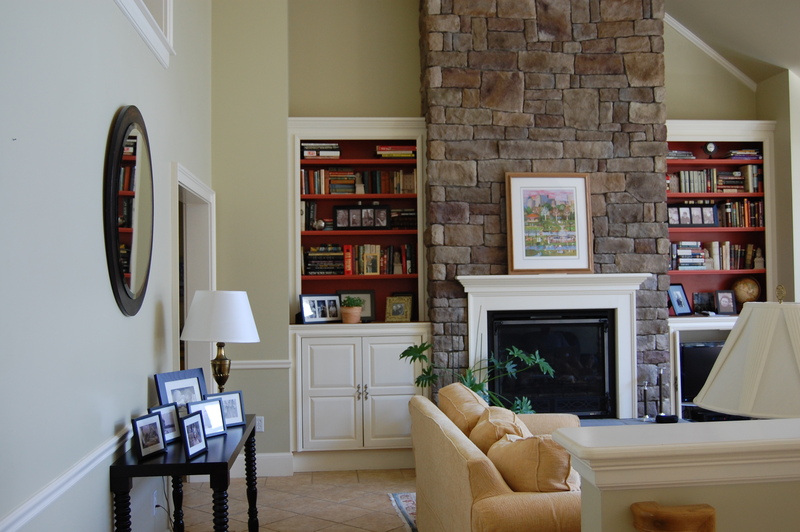 Our client’s home is situated in the most picturesque spot on the banks of the river. It is such a lovely place to work. I also really like the home owners which is an added bonus! Although the house is very nice, it needs some updating. The home is new to my client so she wants to put her stamp on it. We are painting almost the entire interior of the house. In addition to paint, we are rearranging furniture, purchasing some new furniture and hanging art. The photos below are of first room we are tackling. It needs new paint, a sectional sofa, coffee table style ottoman, and maybe a new chair and ottoman. We are keeping the game table and chairs. They have a lovely rug in the space so we do not need to purchase one. 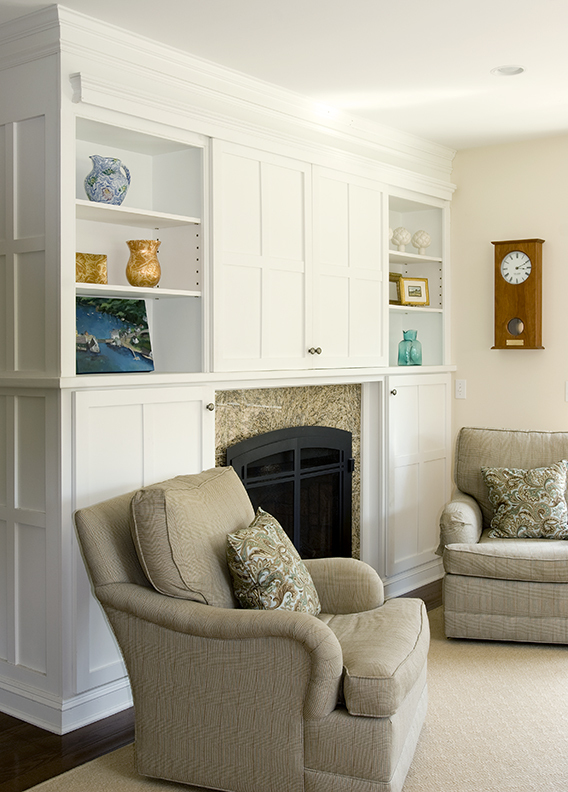 All of the trim will all be painted in Benjamin Moore Decorators White, and the walls will be a version of one of the colors below. We are painting the back of the bookcases, Farrow & Ball Parma Gray-which is far darker than it appears below. We are then looking into sectional for the space. These are three of the options I am pricing out. I like the top and bottom choice. Which one do you like? 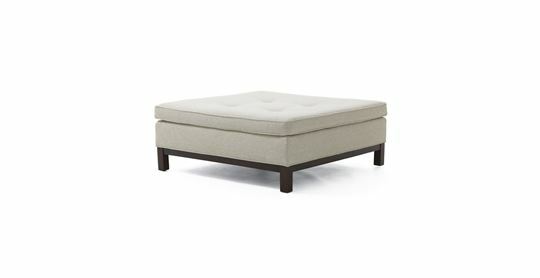 Rather than a coffee table, I would like to use a large square ottoman. I am drawn to the base of the bottom option, but I am not sure if it would be comfortable to put your feet up on. 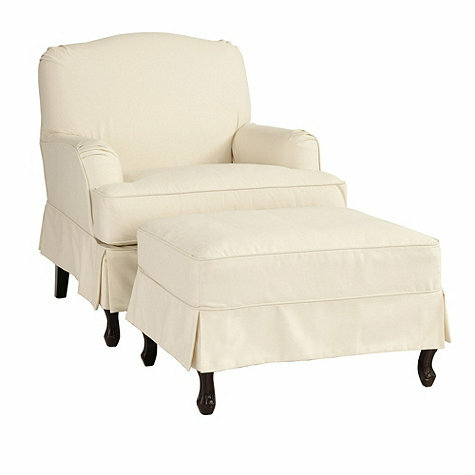 Lastly, I propose moving the blue leather chair and ottoman (in photo above) to the family room and replacing it with one of these. #2 This is a swivel and which would work well in this space, because you could turn toward the sectional or to the AMAZING view. #3 I love this, but I think is too sweet for the space. So this is my first draft idea board for the room. The fabrics and leg finishes will be different, but, this is just a mood board. What do you think? Do you like the direction this room is going in? The view is the star in this house so I do not want to do anything to fussy, formal or trendy. Thank you for stopping by! I would love to hear from you. If you like this post let me know by commenting or liking the post. If you are not part of the Celia Bedilia Club please click the follow button! I look forward to checking in with you next week…I am talking kitchens, and the dos and don’ts of kitchen design. Wow; I could get lost in that view every day. 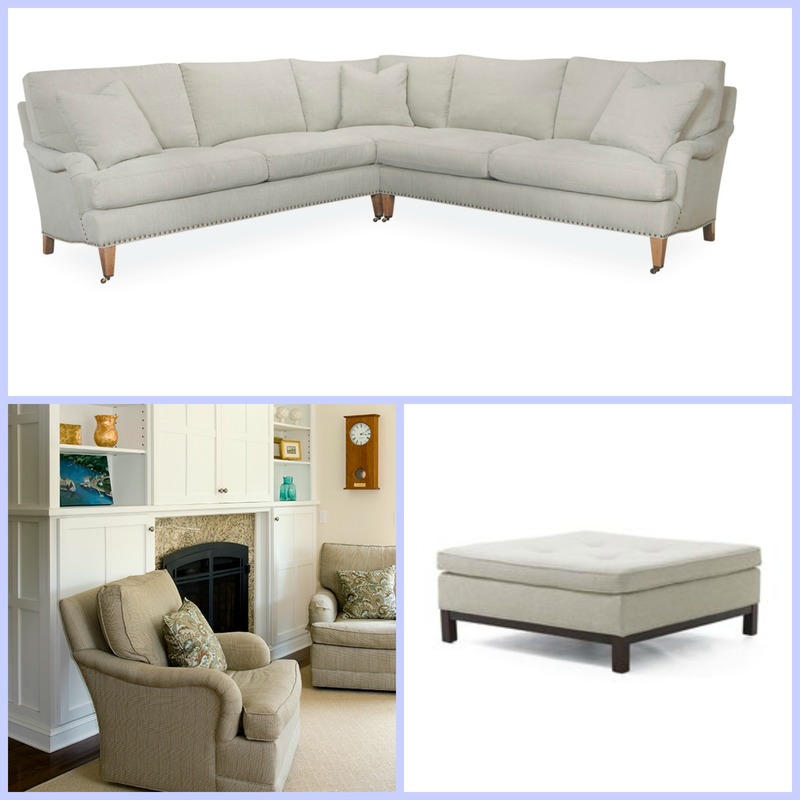 I like the bottom sectional, but I wonder if the top sectional would be more comfortable with the arm rests. 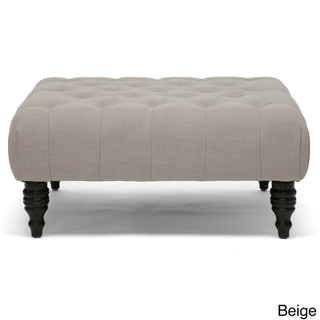 I like the top ottoman, but I think it would look best with the bottom sectional. They all look like great choices. I love the paint color choices. Thank you!!! I hope you are having a great fall. I like the middle sectional best! Such timeless lines — neither modern nor traditional. Such a fabulous room! I do love that middle sectional. It is a real classic. They are available at Home Remedies in Portland Maine if you are in need of one. 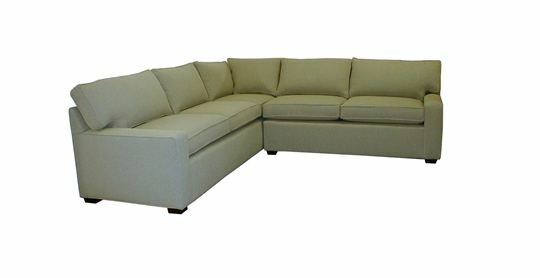 Sectional … use the one with the ARMS!!! The first one. … We made a mistake of buying one with low arms, and it leaves inothing to rest against in the evenings when you put your feet up. 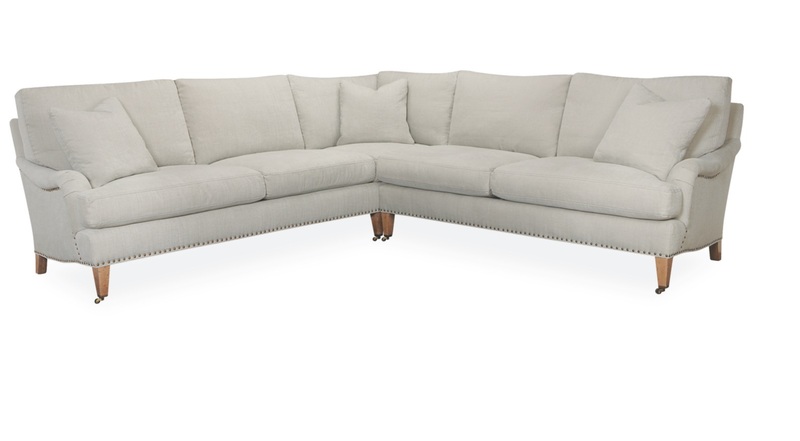 You are right you need arms on a sectional! I HOPE YOU ARE ENJOYING FALL. You are so funny! Thank you for your support. Hmmm. 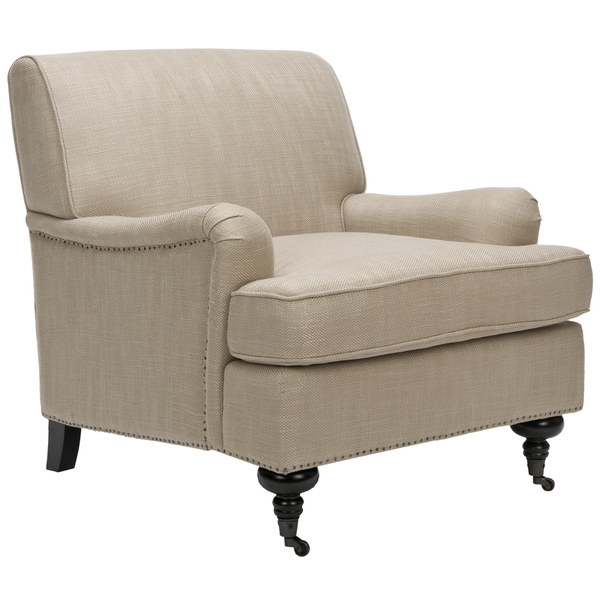 Tough call, but since I’m loving gray these days I’m swayed by the first sofa. What a room!!! Swooning over that view. Vermont fall colors are making me happy, but sun and sea…. Thank you for the comment. How are things in Vermont? Things are well! Blogging fell away this summer and I’m trying to get back on the horse. Would love to reconnect with you.